Museum Roulette is one of the Cultural Wednesday family’s favourite games. It is best played in labyrinthine places such as the V&A or the British Museum. You select a room at random from the plan and head off to find it. Sometimes you never get there because what you find on the way is too interesting not to look at. The Cast Courts are rooms in which it is possible to while away a happy hour, sometimes in solitude. They were originally opened in 1873 especially to hold the museum’s extensive collection of copies. One of the courts has recently reopened after restoration and is now light-filled and not as dusty as its unrestored sibling. 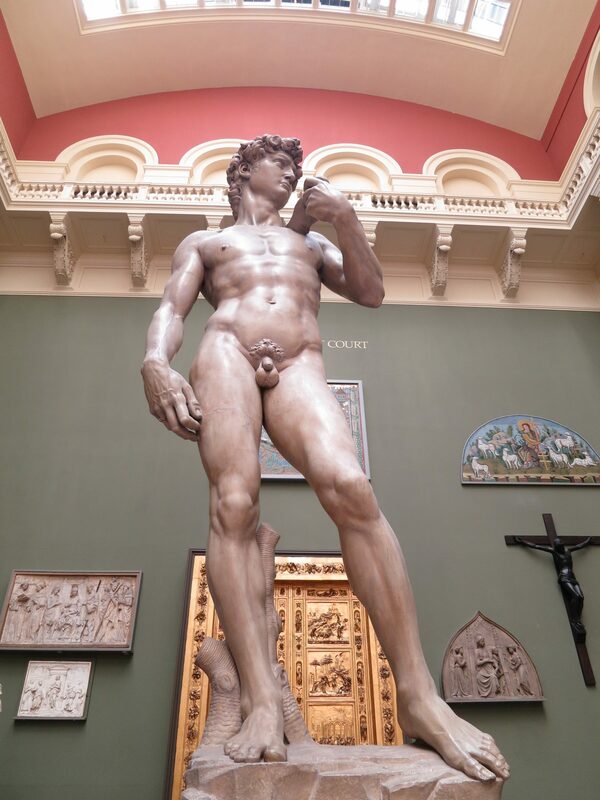 Michelangelo’s David towers over you: in Florence he stands in splendid isolation, not so here. Here he has to fight for attention with the gilded Bronze doors of the Baptistry at Florence Cathedral. Fifteen European Heads of State signed a treaty at the Paris Exposition in 1867 enabling plaster casts to made of important European works of art. Crowds flocked to the see the Cast Courts and in the days before cheap travel and mass tourism it was the nearest that many got the big sights of the Grand Tour. Over on the dusty, paint-peeling, unrestored side of the gallery stands Trajan’s Column, so massive that its copy was made in two parts. 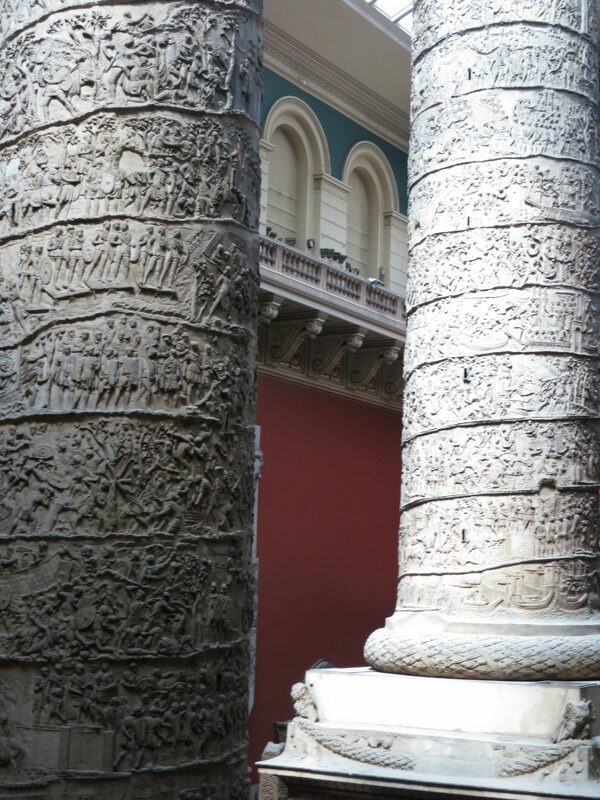 The detail on the column is easier to study here than on the original because there are 150 years less corrosion on the V&A’s copy. Also you can get closer and won’t have to fight through as many crowds to see it. Round the back of the column is the tomb of Henry II that would ordinarily involve a journey to Fontevrault Abbey, nestling nearby a Celtic Cross and over there a Brunswick Lion. 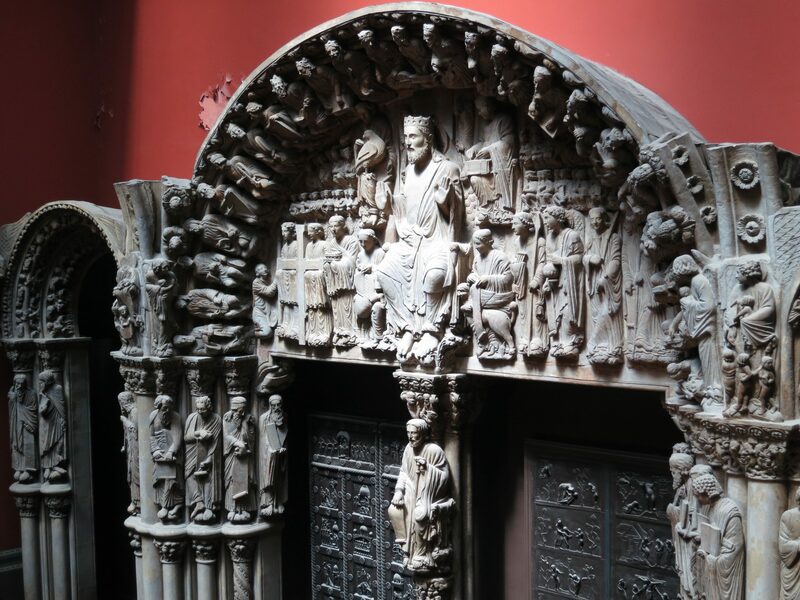 Taking up the whole of the end wall is a copy of the Portico de la Gloria from the Cathedral at Santiago di Compostela. Once you’ve finished your Grand Tour in two rooms, one of the many shops and cafes at the V&A beckon.